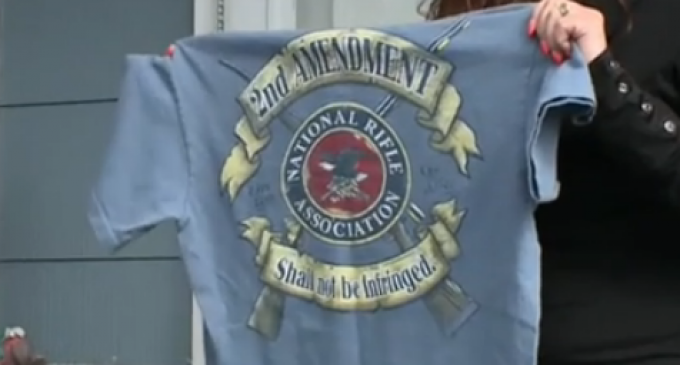 16-year-old Shane Kinney got suspended from his school for refusing to turn his NRA shirt inside-out. According to his parents, a teacher at the high school told Shane the shirt was not appropriate. “They said it was the guns,” said Mr. Kinney, noting that the NRA emblem has crossed rifles. Obviously, the Communist elements currently trying to get rid of guns in this county (no totalitarian state is complete without a disarmed populace) are trying to infuse an intolerant and fearful attitude towards firearms…and no ‘re-education’ of a society is complete without bringing our schools into the mix. Another brick in the wall of communism trying to encircle America! My wife taught school for 40 years. She is a member of the Republican Ladies association in Nevada because of the derelict union that makes teachers look bad! those are muskets not ar-15’s. The rest of the students need to get shirts with guns on them and wear them to school . See if the whole bunch gets suspended. I thought this was Still America , apparently not, Get the NRA to sue the School ! !